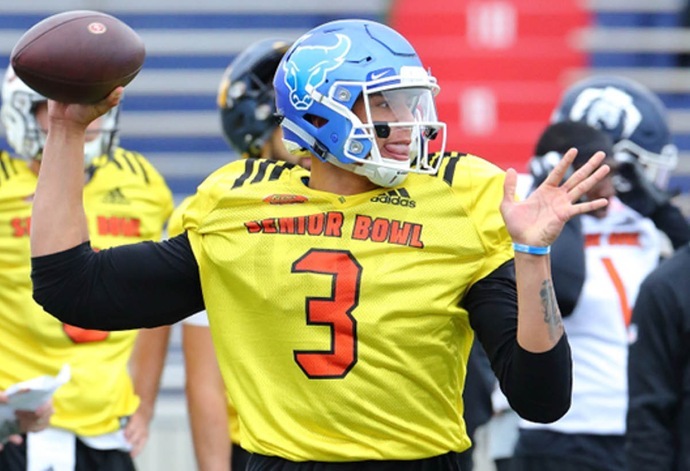 Mobile, AL – Following a standout performance, former University at Buffalo quarterback Tyree Jackson was named the South Most Valuable Player at the Reese's Senior Bowl held at Ladd-Peebles Stadium in Mobile, AL on Saturday. Jackson along with former wide receiver Anthony Johnson played for the South team in the prestigious all-star game. Jackson finished 13-for-21 for 165 yards and two touchdowns in the game. The Norton Shores, MI native had more completions and passing yards than any other quarterback in the game. Jackson made a splash as soon as he took the field as, on his first pass attempt of the game, he launched the ball 54 yards downfield and connected with West Virginia's Gary Jennings. Four plays later, Jackson again connected with Jennings on a quick slant across the middle for a 10-yard touchdown. On a later drive, Jackson found West Virginia's David Sills on a beautiful fade pattern for a 15-yard touchdown. "The (south) receivers played great today," Jackson said. "The receivers all around played great, flying around and the offensive line did a really good job." Johnson also saw action in the game and was targeted on the first play of the second half. The former standout receiver ran a slant pattern over the middle and pulled in a contested pass from Auburn quarterback Jarrett Stidham for a 14-yard gain. It was Johnson's only catch in the game. The North defeated the South, 34-24, in the annual game. Both Jackson and Johnson will next compete in the State Farm All-Star Football Challenge at AT&T Stadium in Arlington, TX on February 1.